More and more examples of Thomas Nevin’s studio portraits have surfaced in recent years, and a few share ONE very odd feature. They have been inexpertly daubed with two colours: RED or raspberry, and VIOLET or blueberry, and some show a total lack of perspective in the process. A modern viewer would assume that these portraits all have their provenance in a family album, and that a small childish hand had been at work with a paintbox. And perhaps that was the case, but there may yet be another explanation for why the portraits below, all bearing Thomas Nevin’s studio stamp, should exhibit such crude hand colouring when the hand-tinting of his other portraits – of family members, of himself, and even of a few convict cartes – is remarkably fine and delicate. The four examples here were all sold commercially, and were painted over after their purchase by their owners who had enough knowledge of stereoscopy to experiment, and may have possessed a stereo viewer. Single cartes were also viewed using a stereoscope, and the addition of colour and lines enhanced the depth of field. They were not painted by Nevin during printing, and they are not stereographs. 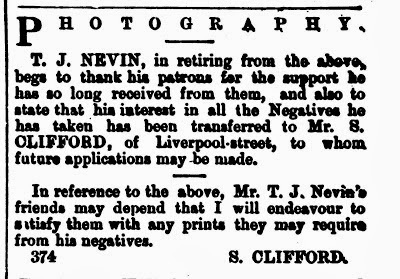 None of Nevin’s stereographs were coloured in this manner. Sir David Brewster’s theories and models of stereoscopy had a huge impact on young photographers around the world in the years 1856-1860 when he published The Stereoscope: Its History, Theory, and Construction, with Its Application to the Fine and Useful Arts and to Education (Murray publishers), and developed a simple light weight companion viewer. 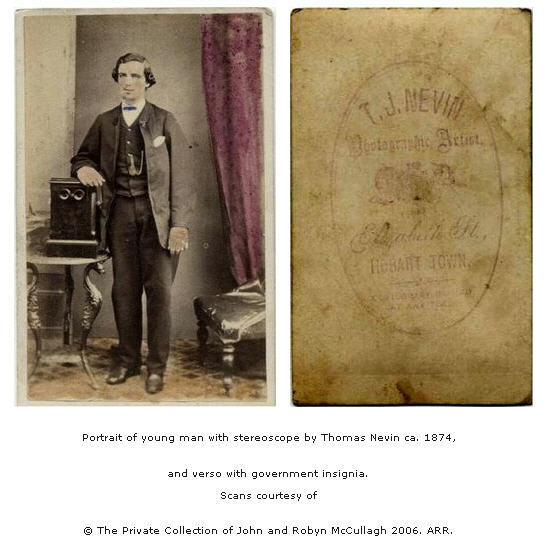 Thomas Nevin was 14 years old in 1856, and his younger brother Jack Nevin was just 4 yrs old. Their father John Nevin was the schoolmaster at the Kangaroo Valley Schoolhouse, situated within the Ancanthe estate where the small (Lady) Franklin Museum housed natural specimens and a library. Both Nevin brothers would grow up to become “keepers” of public buildings – Thomas at the Hobart Town Hall and Public Library when he was 33 years old (1876-1880), and Jack Nevin at H.M. Gaol Hobart in training from the age of 21 as keeper under the auspices of Ringrose Atkins (1874) until his untimely death at age 39 in 1891. And both would become photographers. The term “keeper” is an archaic word used still in Britain to denote a manager of an archive and its house. 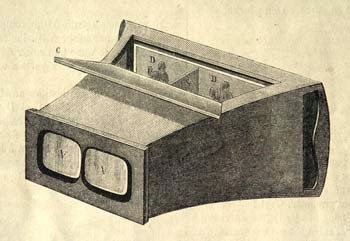 Below: This is the stereoscope of David Brewster (usually called now a “stereograph”) which demonstrated in 1860 his theory of the refrangibility of the colours RED and VIOLET for improved perspective. On the table sits a more sophisticated prototype of his earlier stereoscopic viewer, the binocular model. Notes: This hand-coloured card-mounted stereo photograph, showing Sir David Brewster and a Brewster stereo viewer, was published by the London Stereoscopic Company and retailed from their New York shop about 1860. Reproduced courtesy of T.K. Treadwell, Institute for Photographic Research, Texas, USA . If we place a small red and violet disc, like the smallest wafer, beside one another, so that the line joining their centres is perpendicular to the line joining the eyes, and suppose that rays from both enter the eyes with their optical axes parallel, it is obvious that the distance between the violet images on each retina will be less than the distance between the red images, and consequently the eyes will require to converge their axes to a nearer point in order to unite the red images, than in order to unite the violet images. The red images will therefore appear at this nearer point of convergence, just as, in the lenticular stereoscope, the more distant pair of points in the dissimilar images appear when united nearer to the eye. By the two eyes alone, therefore, we obtain a certain, though a small degree of relief from colours. With the lens Ll, however, the effect is greatly increased, and we have the mm of the two effects. From these observations, it is manifest that the reverse effect must be produced by a concave lens,’ or by the common stereoscope, when two coloured objects are employed or united. The blue part of the object will be seen nearer the observer, and the red part of it more remote. It is, however, a curious fact, and one which appeared difficult to explain, that in the stereoscope the colour-relief was not brought out as might have been expected. Sometimes the red was nearest the eye, and sometimes the blue, and sometimes the object appeared without any relief. The cause of this is, that the colour-relief given by the common stereoscope was the opposite of that given by the eye, and it was only the difference of these effects that ought to have been observed; and though the influence of the eyes was an inferior one, it often acted alone, and sometimes ceased to act at all, in virtue of that property of vision by which we see only with one eye when we are looking with two. In the chromatic stereoscope, Fig. 42, the intermediate part mn of the lens is of no use, so that out of the margin of a lens upwards of 2 £ inches in diameter, we may cut a dozen of portions capable of making as many instruments. These portions, however, a little larger only than the pupil of the eye, must be placed in the same position as in Fig. 42. All the effects which we have described are greatly increased by using lenses of highly-dispersing flint glass, oil of cassia, and other fluids of a great dispersive power, and avoiding the use of compound colours in the objects placed in the stereoscope. It is an obvious result of these observations, that in painting, and in coloured decorations of all kinds, the red or less refrangible colours should be given to the prominent parts of the object to be represented, and the blue or more refrangible colours to the background and the parts of the objects that are to retire from the eye. In this portrait of two children fromthe firm Nevin & Smith, which can be dated accurately at 1868 since it was part of an album gifted to the Duke of Edinburgh by Tasmanian photographers, the drape at the extreme right of frame has received the RED treatment. The colour has deepened with age and dissolved into the paper. The carpet may have been spared. There may be more versions of this image, two in fact for stereoscopic viewing. This example came from the private collection of John Etkins and was donated to the State Library of Victoria in 2005. In this portrait of a handsome young man leaning on a large stereoscopic viewer, the red and violet colours have been added to his bowtie as well as the drape. The studio stamp on verso bears Nevin’s full initials “T. J. Nevin” and the government insignia, which also appears on the verso of his cartes of Tasmanian convicts (conventionally called the Port Arthur convict portraits, 1874). 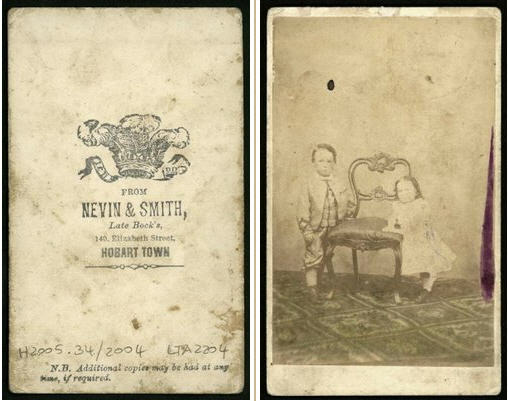 This carte may depict Nevin’s partner Smith and date from ca. 1867. It remains with its owner in the Private Collection of John & Robyn McCullagh. These two images may seem to differ in provenance but not in the strange red blobs arranged in vertical lines leading straight from the bottom of the frame and up the carpet, defying conventional perspective. Both probably originated from the same family in northern Tasmania, booth done by the same person. The top one of the two men was purchased by The QVMAG in 1978. The one below of the young man with his hand on a kitchen chair belongs to a northern Tasmanian private collector. The image on the top is held at the Queen Victoria Museum and Art Gallery, and was reproduced in the TMAG publication Tasmanian Photographers 1840-1940: A Directory (1995) on page 34 above the entry for Samuel Clifford. The writer/editor assumed that the subjects in the image were the photographers Samuel Clifford and Thomas Nevin because of the handwritten inscription of their names on the verso, but several cartes with the same inscription are extant, including the one from the McCullagh Collection of the young man with left hand on a kitchen chair. The red and violet colouring is abundant. Click on images and links to view large versions. None of the men pictured is Thomas Nevin or Jack Nevin or John Nevin. None of these cartes was ever held in Nevin Family Collections, and none was coloured in this way by Nevin or any of his family. 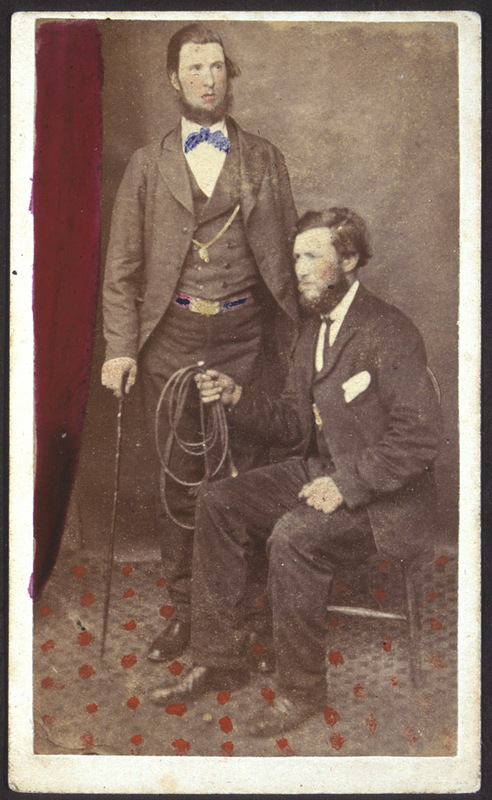 The cdv of the two men was recently exhibited at the QVMAG and published in the catalogue The Painted Portrait Photograph in Tasmania (John McPhee 2007). exhibited at the QVMAG, The Painted Portrait Photograph in Tasmania. November 2007-March 2008. 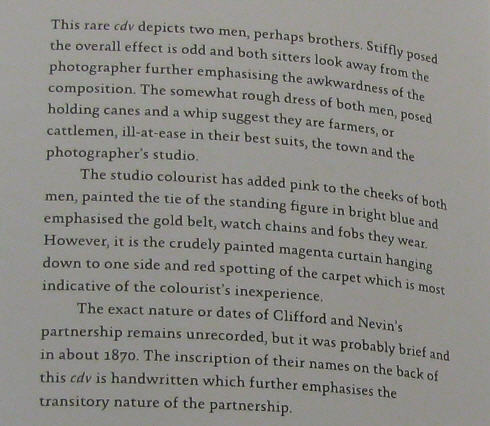 The second paragraph assumes the colouring to be the work of the studio colourist, which was not the case. 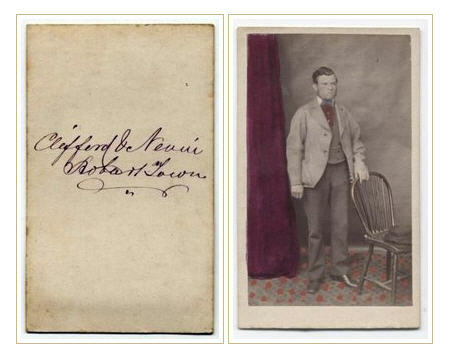 The colouring was done after the purchase of the carte by a family, probably by a child, and not by either photographer’s studio. What has happened here is the inclusion of this carte into a category devised by the exhibition curator called The Photographer’s Studio (p.54 of the catalogue), where all other items in the category are deemed to have been coloured before sale. By such means and comparisons the commentary on this one photograph attributed to Clifford & Nevin (p.63) would like to suggest – and not without derision- the childish daubs to be the amateurish work of the junior partner Nevin. The museum’s accession records would have shown McPhee that the colouring in this photograph, as in the others listed here which have the same strange daubs, all share provenance from a northern Tasmania family, not related to the photographers, who purchased and then coloured them. This scenario, it seems, never occurred to the exhibitors. 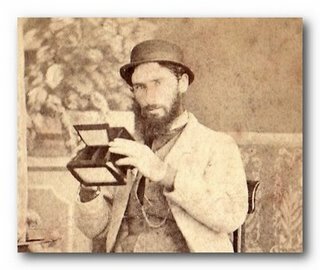 holding a Brewster stereoscopic viewer ca mid-1860s. … and a diagram of the Brewster Stereoscope Viewer, basic model. Brewster’s influences during Nevin’s career extended beyond stereography and stereoscopy to experiments in spirit photography. 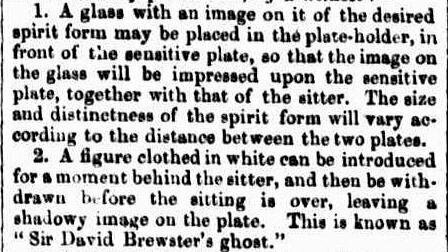 The Brisbane Courier on the 2nd October 1869 published an excerpt from a New York source which revealed how the ghostly figure or spirit could be introduced to the photograph to produce an effect called “Sir David Brewster’s Ghost”. One such experiment went terribly wrong for Nevin on the night of 3rd December 1880 when he was detained but not arrested by Detective Connor on suspicion of acting in concert with a person in a phosphorescent-coated white sheet who had been terrorising the townspeople. For a full newspaper account of the incident, see this article here.